At initial presentation, patients demonstrating features of a hypertensive urgency or emergency (Supplemental Table S3) should be diagnosed as hypertensive and require immediate management (Grade D). In all other patients, at least 2 more readings should be taken during the same visit. If using AOBP, the BP calculated and displayed by the device should be used. If using non-AOBP measurement, the first reading should be discarded and the latter readings averaged. If the visit 1 office BP measurement is high-normal (see thresholds outlined in Section I-3) annual follow-up is recommended (Grade C). If the visit 1 mean AOBP or non-AOBP is high (see thresholds outlined in Section I-3), a history and physical examination should be performed and, if clinically indicated, diagnostic tests to search for target organ damage (Supplemental Table S4) and associated cardiovascular risk factors (Supplemental Table S5) should be arranged within 2 visits. Exogenous factors that can induce or aggravate hypertension should be assessed and removed if possible (Supplemental Table S6). Visit 2 should be scheduled within 1 month (Grade D). If the visit 1 mean AOBP or non-AOBP SBP is ≥180 mmHg and/or DBP is ≥110 mmHg then hypertension is diagnosed (Grade D). If the visit 1 mean AOBP SBP is 135-179 mmHg and/or DBP is 85-109 mmHg OR the mean non-AOBP SBP is 140-179 mmHg and/or DBP is 90-109 mmHg, out-of-office BP measurements should be performed before visit 2 (Grade C). Abulatory BP monitoring is the recommended out-of-office measurement method (Grade D). Patients can be diagnosed with hypertension according to the thresholds outlined in Section I-3. Home BP monitoring is recommended if ambulatory BP monitoring is not tolerated, not readily available, or because of patient preference (Grade D). Patients can be diagnosed with hypertension according to the thresholds outlined in Section I-3. If the out-of-office BP average is not elevated, white coat hypertension should be diagnosed and pharmacologic treatment should not be instituted (Grade C). At visit 4 or 5, mean non-AOBP measurement (averaged across all visits) is ≥140 mmHg systolic or ≥90 mmHg diastolic. Investigations for secondary causes of hypertension should be initiated in patients with suggestive clinical and/or laboratory features (outlined in sections V, VII and VIII) (Grade D). If at the last diagnostic visit the patient is not diagnosed as hypertensive and has no evidence of macrovascular target organ damage, the patient’s BP should be assessed at yearly intervals (Grade D). Hypertensive patients actively modifying their health behaviours should be followed up at 3- to 6-month intervals. Shorter intervals (every 1 or 2 months) are needed for patients with higher BPs (Grade D). Patients on antihypertensive drug treatment should be seen monthly or every 2 months, depending on the level of BP, until readings on 2 consecutive visits are below their target (Grade D). Shorter intervals between visits will be needed for symptomatic patients and those with severe hypertension, intolerance to antihypertensive drugs, or target organ damage (Grade D). When the target BP has been reached, patients should be seen at 3- to 6-month intervals (Grade D). Standardized office BP measurement should be used for follow-up. Measurement using electronic (oscillometric) upper arm devices is preferred over auscultation (Grade C; new guideline). Ambulatory BP monitoring or home BP is recommended for follow-up of patients with demonstrated white coat effect (Grade D; new guideline). 1. At initial presentation, patients demonstrating features of a hypertensive urgency or emergency (Supplemental Table S3) should be diagnosed as hypertensive and require immediate management (Grade D). In all other patients, at least two more readings should be taken during the same visit. If using OBPM, the first reading should be discarded and the latter readings averaged. If using AOBP, the BP calculated and displayed by the device should be used. A marked elevation in blood pressure in the presence of acute symptoms or progressive target organ damage in the brain, eye, heart, or kidney is a hypertensive emergency (1). An asymptomatic severe blood pressure elevation without evidence of target organ damage and not due to an acutely reversible cause (e.g. pain, urinary retention) constitutes a hypertensive urgency (1). Historically, a ≥180/110 mm Hg has been used to define severe blood pressure elevation (2); however, this threshold is arbitrary should be interpreted in the context of the baseline blood pressure and rate of increase. Asymptomatic patients with chronic blood pressure elevations above this threshold may not necessarily have an acute hypertensive urgency. Conversely, patients with low baseline blood pressure levels (e.g. early pregnancy) may develop a hypertensive urgency or emergency at blood pressure levels lower than this threshold (2). The diagnosis of a hypertensive urgency should also be confirmed by performing multiple readings during the visit (and not just with one measurement). Untreated patients with hypertensive emergencies have a median survival of 10.5 months and a 1-year mortality rate of 79% (3). Furthermore, blood pressure rarely normalizes patients presenting with blood pressure levels ≥180/110 mm Hg (4). Therefore, both conditions require the immediate initiation of antihypertensive drug therapy, typically administered intravenously for a hypertensive emergency or orally for a hypertensive urgency. 2. If the visit 1 OBPM is high-normal (see thresholds outlined in Section I-3) annual follow-up is recommended (Grade C). In a trial of subjects with high normal BP, 40% of subjects in the placebo arm developed hypertension within two years and 63% within four years (5). This is consistent with observational data, indicating that these individuals exhibit higher four-year rates of progression to overt hypertension (6). In addition, the 10-year risk of incident cardiovascular disease was greater in both men (hazard ratio 1.6; 95% CI 1.1 to 2.3) and women (hazard ratio 1.8; 95% CI 1.0 to 3.1) with high normal BP than in subjects with BP levels lower than 120/80 mm Hg (7). Those older than 65 years of age with high normal BP levels had the highest risk of progression to hypertension and development of cardiovascular disease. In this group, the crude incidence rate of cardiovascular events per 1000 patient years was 20 in women and 28 in men (7). These data indicate that patients with high normal blood pressure have (a) a higher risk of progression to overt hypertension; and (b) a worse prognosis than patients with optimal blood pressure levels. Therefore, although antihypertensive therapy is not recommended, close surveillance in the form of annual blood pressure checks is recommended. 3. If the visit 1 mean OBPM or AOBP is high (see thresholds outlined in Section I-3), a history and physical examination should be performed and, if clinically indicated, diagnostic tests to search for target organ damage (Supplemental Table S4) and associated cardiovascular risk factors (Supplemental Table S5) should be arranged within two visits. Exogenous factors that can induce or aggravate hypertension should be assessed and removed if possible (Supplemental Table S6). Visit 2 should be scheduled within one month (Grade D). OBPM (which can be done using electronic [oscillometric] or auscultatory devices although the former is preferred) and AOBP (using electronic [oscillometric devices]) are used to initially assess BP. If readings are high, further investigations are indicated and the diagnosis must be verified using out-of-office measurement unless readings are very high (see next sections). 4. If the visit 1 mean OBPM or AOBP SBP is ≥180 mm Hg and/or DBP is ≥110 mm Hg then hypertension is diagnosed (Grade D). Given that the greatest fall in BP occurs between the first and second visits (8-11), it is highly unlikely that BPs in this range will fall to normotensive values at subsequent visits. 5. If the visit 1 mean OBPM SBP is 140-179 mm Hg and/or DBP is 90-109 mm Hg OR the mean AOBP SBP is 135-179 mm Hg and/or DBP is 85-109, out-of-office BP measurements should be performed before visit 2 (Grade C). i. ABPM is the recommended out-of-office measurement method (Grade D). Patients can be diagnosed with hypertension according to the thresholds outlined in Section I-3. ii. HBPM is recommended if ABPM is not tolerated, not readily available or due to patient preference (Grade D). Patients can be diagnosed with hypertension according to the thresholds outlined in Section I-3. iii. If the out-of-office BP average is not increased, white-coat hypertension should be diagnosed and pharmacologic treatment should not be instituted (Grade C). If mean OBPM and/or AOBP readings are high, out-of-office measurement (ABPM or HBPM) should be performed to make the diagnosis of hypertension. Out-of-office measurements are prognostically superior to OBPM in predicting mortality and cardiovascular events (12-16). HBPM is also often categorized as self-measured blood pressure (SMBP). ABPM is preferred to HBPM because it permits blood pressure to be assessed over the entire 24-hour period, including at night. Nocturnal blood pressure, including failure of the blood pressure to dip by 10-20%, is the strongest predictor of future cardiovascular events or total mortality (17). If ABPM is unavailable or unsuccessful, HBPM should be performed. Out-of-office BP measurement allows diagnosis of hypertension to be made earlier and more accurately. Early diagnosis can facilitate faster blood pressure control and, in clinical trials of higher risk hypertensive patients, early control was associated with reductions in cardiovascular events (18-20). Studies supporting the prognostic value of ABPM include the Office versus Ambulatory Pressure (OvA) study (21), in which 1963 subjects treated for hypertension were followed for five years. ABPM was an independent risk factor for new cardiovascular events (RR for each 1 SD increase in SBP of 1.34 [95% CI 1.11 to 1.62]) after adjusting for other risk factors, including office measurement of BP. The Ohasama cohort (22), with 1542 Japanese subjects followed for more than eight years, also reported that ABPM was independently predictive of cardiovascular mortality, as did a substudy (23) of the Systolic Hypertension in Europe (Syst-Eur) Trial, which was limited to elderly patients with isolated systolic hypertension. There are also several studies supporting the prognostic value of home/self BP monitoring and, thus, the inclusion of this technique for the diagnosis of hypertension. The Self measurement of blood pressure at Home in the Elderly: Assessment and Follow-up (SHEAF) study (24), followed 4939 treated hypertensive patients for a mean of 3.2 years, and reported that home monitoring was independently predictive of future cardiovascular events. Each 10 mm Hg increase in home monitored BP increased the risk of a cardiovascular event by 17.2% (95%CI 11.0% to 23.8%). The Ohasama cohort, including 1913 Japanese subjects followed for approximately 11 years, has also shown that baseline home BP measurement is predictive of several outcomes, including stroke (25), all-cause mortality (26) and cardiovascular mortality (27). These prognostic studies, with extended follow-up and ‘hard’ end points, are the evidence on which the use of home BP measurement was included in the diagnosis of hypertension. Out-of-office measurement is preferred because it identifies individuals with ‘white coat hypertension’, also known as ‘isolated office hypertension’. 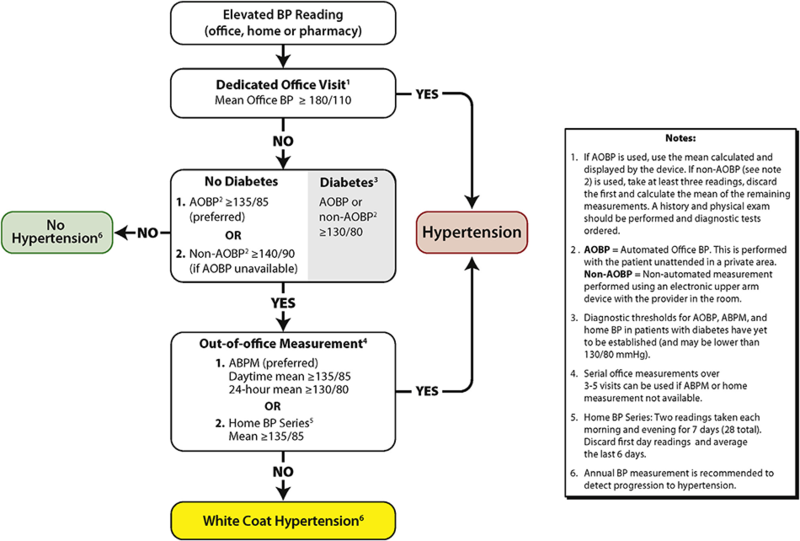 White coat hypertension is defined as elevated OBPM (≥140/90 mm Hg) with normal out-of-office readings (<135/85 mm Hg daytime ABPM or HBPM and/or <130/80 mm Hg 24-hr ABPM). The prevalence of white coat hypertension in patients with elevated screening readings ranges from 9-30% (28-30). Both ABPM and HBPM have been shown to be effective in diagnosing WCH, and both methods have been shown to be more strongly associated with cardiovascular outcomes than OBPM (31-41). Using office blood pressure measurement alone can misclassify patients who do not have hypertension (42-44). In Canada, this will misdiagnose 100 patients daily or 36,500 patients annually as hypertensive (who actually have white coat hypertension)(45). Many of these patients will be treated unnecessarily with anti-hypertensive medications as pharmacologic treatment of subjects with white coat hypertension is currently not recommended. (30,46-48). White coat hypertension is not entirely benign, as it may be an intermediate condition between normotension and hypertension and should be followed up for future progression to hypertension (49,50). White coat hypertensives have higher left ventricular mass index when compared with normotensive subjects (51). However, the overall risk of cardiovascular events appears similar to normotension (30,31,52,53). iii. At visit 5, mean OBPM (averaged across all visits) is ≥140 mm Hg systolic or ≥90 mm Hg diastolic. If neither ABPM nor HBPM are available, serial OBP measurements over several visits can be used to make the diagnosis although this is not a preferred diagnostic method and every effort should be made to perform out-of-office measurement. If OBP is used to diagnose hypertension, a stepwise approach is required, with measurements performed over 3-5 visits and the diagnosis contingent upon the degree of BP elevation (when averaged across all visits). In general, the closer the initial readings are to normal, the greater the risk of misclassification (8,11,54). More readings, at more frequent intervals, are required to establish a diagnosis of hypertension in those whose blood pressure is close to the normal blood pressure range. For those whose blood pressure is between 90 and 95 mm Hg at the first clinic visit, 7% to 24% will be misclassified as hypertensive after 4 visits (8,11). 7. Investigations for secondary causes of hypertension should be initiated in patients with suggestive clinical and/or laboratory features (outlined in sections V and VI) (Grade D). Background and references are cited in the appropriate sections below. 8. If at the last diagnostic visit the patient is not diagnosed as hypertensive and has no evidence of microvascular target organ damage, the patient’s BP should be assessed at yearly intervals (Grade D). This expert consensus recommendation is made to ensure that these individuals are not lost to follow-up. Because they have had initially high screening readings, they remain at higher risk for hypertension and follow-up is warranted. 9. Hypertensive patients actively modifying their health behaviours should be followed up at 3- to 6-month intervals. Shorter intervals (every 1 or 2 months) are needed for patients with higher BP (Grade D). These expert-consensus recommendations have been provided to give practitioners some guidance for the follow-up of patients diagnosed with hypertension. 10. Patients receiving antihypertensive drug treatment should be seen monthly or every 2 months, depending on the level of BP, until readings on two consecutive visits are below their target (Grade D). Shorter intervals between visits will be needed for symptomatic patients and those with severe hypertension, intolerance to antihypertensive drugs, or target organ damage (Grade D). When the target BP has been reached, patients should be seen at 3- to 6-month intervals (Grade D). 11. Standardized office BP measurement should be used for follow-up. Measurement using electronic (oscillometric) upper arm devices is preferred over auscultation (Grade C). Evidence-based recommendations for follow-up BP assessment are very important as they frequently inform BP treatment initiation and/or intensification. However, there are patient, procedure, and device sources of measurement variation that can have significant clinical implications (55-56). Several studies have demonstrated that routine manual BP reading (SBP/DBP) are on average 9/6 mm Hg higher when compared with the corresponding research quality manual BP measurements (57-58). This can lead to significant misclassification of hypertensive status and inappropriate treatment (57,59). Thus, ensuring standardization and systematic measurement in the follow-up of adults with hypertension will help obtain accurate measurement and promote safe and appropriate BP treatment. shorter duration and evaluated surrogate outcomes (61-68). These studies compared out-of-office BP measurement methods (ambulatory or home BP monitoring) with office-based BP measurements and had significant variation in study methodologies, approaches to out-of-office BP management, and BP treatment thresholds. Overall, the out-of-office measurement groups had lower treatment intensity and higher BP values, in keeping with white coat effect being identified and managed less intensively, while the short-term intermediate outcomes were similar to office-based measurement approaches. In summary, there is limited evidence on measuring follow-up BPs in adults with hypertension, and thus, at present, there are insufficient data to make a recommendation for a single measurement method. What has been established is that measurement variation is common and concerning, thus standardized methods of BP measurement should be employed, preferably using electronic (oscillometric) devices (Supplemental Table S2). 12. Ambulatory BP monitoring or home BP is recommended for follow-up of patients with demonstrated white coat effect (Grade D). For hypertensive patients with white coat effect, no trial has specifically examined optimal follow-up strategies to date. In RCTs of BP follow-up strategies, patients in whom antihypertensive medications have either been reduced or stopped are thought to represent those individuals with white coat effect. Two RCTs comparing the use of home with office BP measurements demonstrated a significant reduction in antihypertensive medication use without changes in other clinical cardiovascular surrogate outcomes when home BP monitoring was used (61,67). Similarly, reduction in antihypertensive medications use was observed in another RCT when ambulatory BP monitoring was used to titrate medications (63). All three RCTs are limited, however, by the use of the same BP target in both arms regardless of measurement method. Overall, this limited evidence suggests that either ambulatory or home BP monitoring can be used for BP follow-up in patients with white coat effect, though there remains a paucity of data on the specific frequency of monitoring to guide clinical practice. The fifth report of the Joint National Committee on Detection, Evaluation, and Treatment of High Blood Pressure. Arch Intern Med 1993; 153:154–183. Marik PE, Varon J. Hypertensive Crises. Chest 2007;131:1949. Keith NM, Wagener HP, Barker NW. Some different types of essential hypertension: their course and prognosis. Am J Med Sci 1939; 197:332-343. Management Committee of the Australian Therapeutic Trial in Mild Hypertension. Untreated mild hypertension. Lancet 1982; 1(8265):185-91. Julius S, Nesbitt SD, Egan BM, et al; Trial of Preventing Hypertension (TROPHY) Study Investigators. Feasibility of treating prehypertension with an angiotensin-receptor blocker. N Engl J Med 2006;354:1685-97. Vasan RS, Larson MG, Leip EP, Kannel WB, Levy D. Assessment of frequency of progression to hypertension in non-hypertensive participants in the Framingham Heart Study: A cohort study. Lancet 2001;358:1682-6. Perry HM Jr, Miller JP. Difficulties in diagnosing hypertension: Implications and alternatives. J Hypertens 1992;10:887-96. Rosner B: Screening for hypertension- some statistical observations. J Chron Dis 1977;30: 7- 18. Rosner B, Polk BF: The implications of blood pressure variability for clinical and screening purposes. J Chron Dis 1979;32: 451-461. Brueren MM, Petri H, van Weel C, van Ree JW. How many measurements are necessary in diagnosing mild to moderate hypertension. Fam Pract 1997;14:130-5. Ward AM, Takahashi O, Stevens R, Heneghan C. Home measurement of blood pressure and cardiovascular disease: systematic review and meta-analysis of prospective studies. J Hypertens 2012;30:449-56. Hansen TW, Li Y, Boggia J, et al. Predictive Role of the Nighttime Blood Pressure. Hypertension 2010;57:3-10. Hansson l, Lindholm LH, Niskanen L, et al. Effect of angiotensin- converting-enzyme inhibition compared with conventional therapy on cardiovascular”mordibity and mortality in hypertension: The Captopril Prevention Project (CAPPP) randomised trial. Lancet 1999;353:611- 6. Clement DL, De Buyzere ML, De Bacquer DA, et al; Office versus Ambulatory Pressure Study Investigators. Prognostic value of ambulatory blood-pressure recordings in patients with treated hypertension. N Engl J Med 2003;348: 2407-15. Ohkubo T, lmai Y, Tsuji I, et al. Prediction of mortality by ambulatory blood pressure monitoring versus screening blood pressure measurements: A pilot study in Ohasama. J Hypertens 1997;15:357 -64. Staessen JA, Thijs L, Fagard R, er al. Predicting cardiovascular risk using conventional vs ambulatory blood pressure in older patients with systolic hypertension. Systolic Hypertension in Europe Trial Investigators. JAMA 1999;282:539-46..
Ohkubo T, lmai Y, Tsuji I, et al. Home blood pressure measurement has a stronger predictive power for mortality than does screening blood pressure measurement: A population-based observation in Ohasama, Japan. J Hypertens 1998;16:971-5. Fagard RH, Cornelissen VA. Incidence of cardiovascular events in white-coat, masked and sustained hypertension versus true normotension: a meta-analysis. J Hypertens 2007;25:2193-8. O’Brien E, Parati G, Stergiou G, Asmar R, Beilin L, Bilo G, et al. European Society of Hypertension position paper on ambulatory blood pressure monitoring. J Hypertens 2013;31:1731-68. Franklin SS, Thijs L, Hansen TW, O’Brien E, Staessen JA. White-coat hypertension: new insights from recent studies. Hypertension 2013;62:982-7. Hansen TW, Kikuya M, Thijs L, Bjorklund-Bodegard K, Kuznetsova T, Ohkubo T, et al. Prognostic superiority of daytime ambulatory over conventional blood pressure in four populations: a meta-analysis of 7030 individuals. J Hypertens 2007;25:1554-64. Dolan E, Stanton A, Thijs L, Hinedi K, Atkins N, McClory S, et al. Superiority of ambulatory over clinic blood pressure measurement in predicting mortality. Hypertension 2005;46:56-61. Niiranen TJ, Hanninen MR, Johansson J, Reunanen A, Jula AM. Home-measured blood pressure is a stronger predictor of cardiovascular risk than office blood pressure: the Finn-Home study. Hypertension 2010;55:1346-51. Asayama K, Ohkubo T, Kikuya M, Metoki H, Obara T, Hoshi H, et al. Use of 2003 European Society of Hypertension-European Society of Cardiology guidelines for predicting stroke using self-measured blood pressure at home: the Ohasama study. Eur Heart J 2005;26:2026-31. Ohkubo T, Imai Y, Tsuji I, Nagai K, Kato J, Kikuchi N, et al. Home blood pressure measurements has a stronger predictive power for mortality than does screening blood pressure measurements: a population-based observation in Ohasama, Japan. J Hypertens 1998;16:971-5. Bobrie G, GenÃ¨s N, Vaur L, Clerson P, Vaisse B, Mallion JM, et al. Is “isolated home” hypertension as opposed to “isolated office” hypertension a sign of greater cardiovascular risk? Arch Intern Med 2001;161:2205-11. Stergiou GS, Siontis KCM, Ioannidis JPA. Home blood pressure as a cardiovascular outcome predictor: it’s time to take this method seriously. Hypertension 2010;55:1301-3. Conen D, Bamberg F. Noninvasive 24-h ambulatory blood pressure and cardiovascular disease: a systematic review and meta-analysis. J Hypertens 2008;26:1290-9. Boggia J, Li Y, Thijs L, Hansen TW, Kikuya M, Bjorklund-Bodegard K, et al. Prognostic accuracy of day versus night ambulatory blood pressure: a cohort study. Lancet 2007;370:1219-29. Fagard RH, Celis H, Thijs L, Staessen JA, Clement DL, De Buyzere ML, et al. Daytime and nighttime blood pressure as predictors of death and cause-specific cardiovascular events in hypertension. Hypertension 2008;51:55-61. Myers MG, Godwin M, Dawes M, Kiss A, Tobe SW, Kaczorowski J. Conventional versus automated measurement of blood pressure in the office (CAMBO) trial. Family Practice. 2012;29:376-82. Campbell NRC, Culleton BW, McKay D. Misclassification of blood pressure by usual measurement in ambulatory physician practices. Am J Hypertens 2005;18:1522-7. Kay LE. Accuracy of blood pressure measurement in the family practice center. J Am Board Fam Pract 1998;11:252-8. Robitaille C, Dai S, Waters C, Loukine L, Bancej C, Quach S, et al. Diagnosed hypertension in Canada: incidence, prevalence and associated mortality. CMAJ 2012;184:E49-E56. Pickering TG, Levenstein M, Walmsley P. Differential effects of doxazosin on clinic and ambulatory pressure according to age, gender, and presence of white coat hypertension. Results of the HALT Study. Hypertension and Lipid Trial Study Group. Am J Hypertens 1994;7:848-52. Pickering TG. White coat hypertension. Curr Opin Nephrol Hypertens 1996;5:192-8. Fagard RH, Staessen JA, Thijs L, Gasowski J, Bulpitt CJ, Clement D, et al. Response to antihypertensive therapy in older patients with sustained and nonsustained systolic hypertension. Systolic Hypertension in Europe (Syst-Eur) Trial Investigators. Circulation 2000;102:1139-44. Mancia G, Bombelli M, Facchetti R, Madotto F, Quarti-Trevano F, Polo Friz H, et al. Long-term risk of sustained hypertension in white-coat or masked hypertension. Hypertension 2009;54:226-32. Ugajin T, Hozawa A, Ohkubo T, Asayama K, Kikuya M, Obara T, et al. White-coat hypertension as a risk factor for the development of home hypertension: the Ohasama study. Arch Intern Med 2005;165:1541-6. .
Sega R, Trocino G, Lanzarotti A, Carugo S, Cesana G, Schiavina R, et al. Alterations of cardiac structure in patients with isolated office, ambulatory, or home hypertension: Data from the general population (Pressione Arteriose Monitorate E Loro Associazioni [PAMELA] Study). Circulation 2001;104:1385-92. Verdecchia P, Reboldi GP, Angeli F, Schillaci G, Schwartz JE, Pickering TG, et al. Short- and long-term incidence of stroke in white-coat hypertension. Hypertension 2005;45:203-8. Stergiou GS, Asayama K, Thijs L, Kollias A, Niiranen TJ, Hozawa A, et al. Prognosis of white-coat and masked hypertension: International Database of HOme blood pressure in relation to Cardiovascular Outcome. Hypertension 2014;63:675-82. Rosner B, Polk F. Predictive values of routine blood pressure measurements in screening for hypertension. Am J Epidemiol 1983;117:429-42. Kallioinen N, Hill A, Horswill MS, Ward HE, Watson MO. Sources of inaccuracy in the measurement of adult patients’ resting blood pressure in clinical settings: a systematic review. Journal of Hypertension. 2017;35:421-441. Rinfret F, Cloutier L, Wistaff R, et al. Comparison of Different Automated Office Blood Pressure Measurement Devices: Evidence of Nonequivalence and Clinical Implications. Can J Cardiol. 2017;33:1639-1644. Myers MG. Automated blood pressure measurement in routine clinical practice. Blood Press Monit. 2006;11:59-62. Rinfret F, Cloutier L, L’Archeveque H, et al. The Gap Between Manual and Automated Office Blood Pressure Measurements Results at a Hypertension Clinic. Can J Cardiol. 2017;33:653-657. Campbell N, Culleton B, McKay D. Misclassification of blood pressure by usual measurement in ambulatory physician practices. American Journal of Hypertension. 2005;18:1522-1527. Schrader J, Lüders S, Züchner C, Herbold M, Schrandt G. Practice vs ambulatory blood pressure measurement under treatment with ramipril (PLUR Study): a randomised, prospective long-term study to evaluate the benefits of ABPM in patients on antihypertensive treatment. Journal of Human Hypertension. 2000;14:435-440. Staessen JA, Byttebier G, Buntinx F, Celis H, O’brien ET, Fagard R. Antihypertensive treatment based on conventional or ambulatory blood pressure measurement: a randomized controlled trial. JAMA. 1997;278:1065-1072. Tobe SW, Hunter K, Geerts R, Raymond N, Pylypchuk G. IMPPACT: investigation of medical professionals and patients achieving control together. Can J Cardiol. 2008;24:205-208. Verberk WJ, Kroon AA, Lenders JW, et al. Self-measurement of blood pressure at home reduces the need for antihypertensive drugs. Hypertension. 2007;50:1019-1025. Stergiou GS, Karpettas N, Destounis A, et al. Home blood pressure monitoring alone vs. combined clinic and ambulatory measurements in following treatment-induced changes in blood pressure and organ damage. American Journal of Hypertension. 2014;27:184-192. Broege PA, James GD, Pickering TG. Management of hypertension in the elderly using home blood pressures. Blood pressure monitoring. 2001;6:139-144. Niiranen TJ, Kantola IM, Vesalainen R, Johansson J, Ruuska MJ. A comparison of home measurement and ambulatory monitoring of blood pressure in the adjustment of antihypertensive treatment. American Journal of Hypertension. 2006;19:468-474. Staessen JA, Den Hond E, Celis H, et al. Antihypertensive treatment based on blood pressure measurement at home or in the physician’s office: a randomized controlled trial. JAMA. 2004;291:955-964.
da Silva GV, De Barros S, Abensur H, Ortega KC, Mion Jr D. Home blood pressure monitoring in blood pressure control among haemodialysis patients: an open randomized clinical trial. Nephrology Dialysis Transplantation. 2009;24:3805-3811.